Coursing is a fun and exciting sport that elicits one of the most basic instincts of dogs – prey drive. It involves dogs chasing a mechanically operated lure, which is attached to a line guided by pulleys. 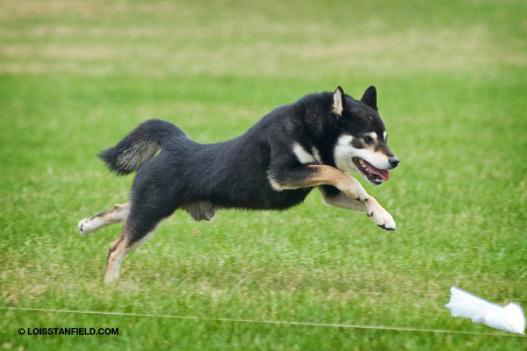 Because Coursing calls on the truly instinctive nature of a Shiba to hunt, it is of utmost importance to keep your dog in great shape, for many of them will “give it their all”, which could lead to injury if they are overweight or not used to much activity. Dogs must be at least one year of age to participate. Other than being in shape there is really no other prep work or training necessary to participate. Just sign up and join in the fun! In the past, lure coursing was only available to sighthound breeds, but AKC now offers it to all dogs in the form of a Coursing Ability Test (CAT) program. In this program, dogs run one at a time and are judged on a pass/fail basis. Titles are awarded for 3, 10, 25, and every 25 passes thereafter. While courses are designed with safety in mind and must not contain turns of more than 90 degrees, they are 600 yards long, which is a long distance for an all-out sprint. Another version of coursing is a straight line 100 yard dash that is timed with the yards per second converted to mph. The speed is then converted to points by multiplying by a handicap factor based on the dog’s height at the withers. Titles are awarded when 150, 500, 1500, etc. points are earned.